Are Your Heirs Ready for Prime Time? According to the renowned Williams Group with over 50 years of coaching families in preparing heirs, their research studies have established that 70% of wealth transitions fail (defined as involuntary loss of control of assets). If this is to be believed, clearly important elements are missing from the current approach to estate planning, allowing this staggering failure rate to continue. 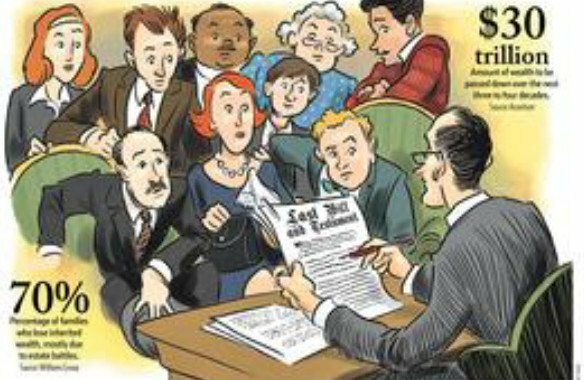 According to Williams, the key missing element in wealth transfer planning is an awareness of how to proceed with the preparation of their “heirs”. The hand off of responsibilities for the family wealth could not be sidestepped, and heirs felt the weight of expectations without the security of preparation. The amount of wealth to be transferred over the next 50 years is estimated to be between $37 and $44 Trillion. Wealth, as defined by the Federal Reserve, consists of homes, personal property, business holdings, real property, stocks, bonds, cash on deposit, etc. Accompanying that wealth transfer is the unavoidable annual transfer of control for an estimated 270,000 estates of $1M or more. The “control” responsibility falls on the designated heirs, trustees, or professional managers — whether prepared or not, and whether they share the family’s values or not. Those who make plans to transition wealth are ultimately concerned about its impact on the lives and well-being of the beneficiaries. If you are one of these 270,000 estates over $1M, are you asking yourself “what difference will the wealth make in the lives of our children and grandchildren?” “Will the family’s values underlying the accumulation of the wealth be reflected in how the wealth is used?” “How will the wealth impact the communities in which I live?” If not, perhaps you should be asking these questions.